All industrial machinery vibrates. Monitoring the level of vibration is a useful guide to a machine’s condition. Poor balance, worn bearings, misalignments, and loose fittings in the structure will increase levels of vibration. By monitoring vibration levels, you can determine when machinery needs maintenance. 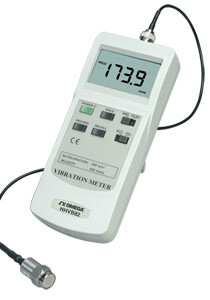 The HHVB82 vibration meter, with its magnetic mount vibration sensor, is the ideal tool for this application. 注: Comes complete with 9 V battery, vibration sensor, cable, magnetic base, rugged case, operator’s manual.